A map showing the locations of the two attacks. The terrorist group said one of its gunmen shot dead the manager of a Dubai-owned port in Somalia's semi-autonomous region of Puntland. Three other people were wounded in the incident. Mohamad Dahir, a local security official, told the French news agency AFP, "An armed man shot and killed Paul Anthony Formosa who was the construction project manager for DP World. He was killed inside the port and the security forces also shot the killer on the spot." 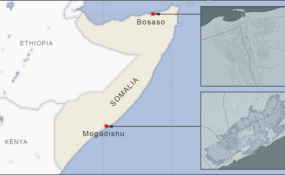 "We are behind the operation," Abdiasis Abu Musab, a spokesman for al-Shabab's military operations told Reuters. "We had warned him, but he turned deaf ear. He was illegally in Somalia." An al-Shabab statement said the attack at the port was "part of broader operations targeting the mercenary companies that loot the Somali resources." Elsewhere in Somalia Monday, authorities say a powerful blast in Somalia's capital, Mogadishu, killed at least nine people. Police officer Ahmed Moalin Ali told AFP that terrorists parked a vehicle loaded with explosives near a mall "to kill the innocent civilians."